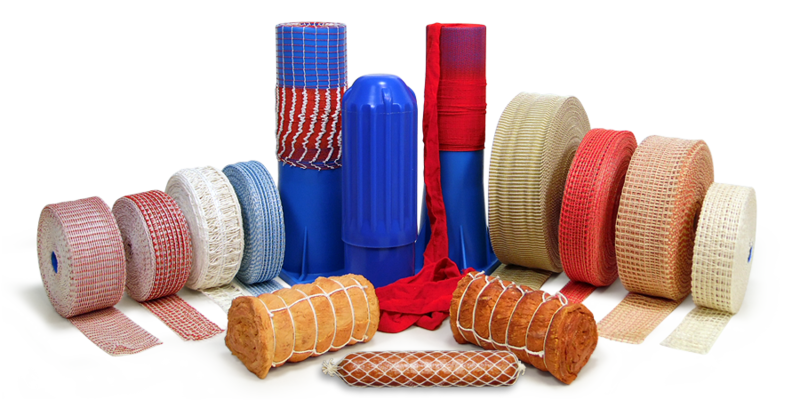 Welcome to the webshop of TOM TYE-O-Matic B.V.
TOM is one of the Dutch leading manufacturers of meat netting and equipment for the meat industry and can offer a wide range of products known in 15 countries in Europe,the USA and Canada. Thanks to a practical knowledge of meat processing technologies, we have developed industry-specific meat netting and equipment. All comply with standards of hygiene and quality of the production. With TOM and his meat netting and equipment you get the best possible economic return. Of course all our nets have migration testing certificates. Elastic meat netting for Poultry, Polyester Meat/Poultry Netting and Gammon meat netting. Elastic meat netting for gammon meat processing, Gammon Productions net, Gammon Steak net. Meat Processing Equipment netting machines netloader and plastic filling tube, and hand loaders. Netting machines, pneumatic netting machine, netting parma, netloader, net loader, netjet, rolled meat netting. Elastic meat netting for pork, elastic meat netting for beef joints , elastic meat netting for beef. Elasticated meat net for a pork tenderloin, Stuffed Pork Roast Loin elastic netting. Baconnet Red/white, pork bely netting heavy duty, Ham netting heavy duty.